Order all your general groceries, Highland & Island speciality fine foods, beers, wines, spirits. Order & book a free home delivery. Pre-arrange your groceries delivered, rather than haul them all here. In a remote place like this save ‘food miles’. Save yourself the time & effort of physically shopping. Support an independent local shop in the area where you’re staying, rather than a multi-national conglomerate elsewhere. It was great to be able to arrive at our holiday cottage & find all our groceries already there. It made a really nice start to our holiday. 1. Download a shopping list. Download a FULL LIST of general groceries, fruit & vegetables, beers, wines, spirits & Highland & Island speciality fine foods that we supply. (Alternatively see Welcome Packs). Just select a shopping area (at the top of the shopping list). Insert quantities against the items you're shopping for. To return to the start index click on the links on the list. 3. Email us your list. Include your name / contact details & where / when you'd like delivery. We'll send you a priced confirmation of your order & if OK then request your payment details. In the event we haven’t got precisely what you want we can normally offer a close alternative. We’re re-stocked frequently but the more prior notice you can give the better. You're welcome to make changes to your order. (additions, omissions or substitutions). We'll do our best to accommodate any changes you wish to make..
We accept most cards (but not American Express). Simply call us with your card details & we'll process your payment. We'll enclose a receipt with your delivery. 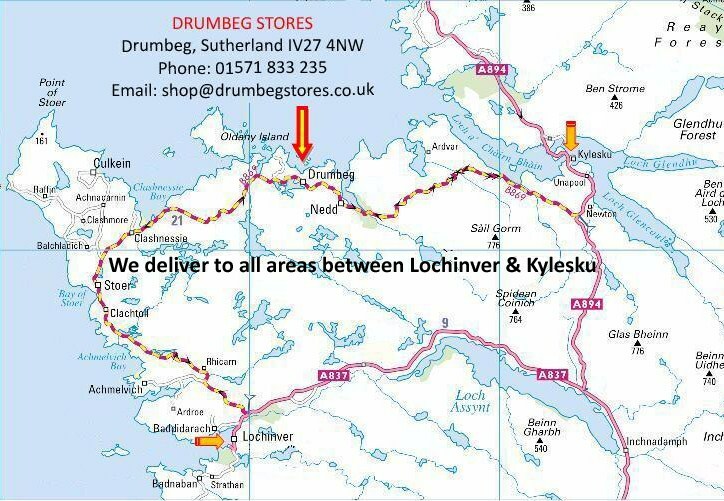 All areas between Lochinver & Kylesku ~ including Achmelvich, Clachtoll, Stoer, Clashnessie, Clashmore, Raffin, Culkien Stoer, Drumbeg, Culkien Drumbeg, Nedd & Unapool. We deliver at any mutually convenient time. If you're travelling to a holiday cottage & running early or later than expected we're very flexible. Just let us know. Arriving At A Holiday Cottage? We can usually arrange to deliver and put your groceries in your kitchen / fridge / freezer in advance of your time of arrival. All we need to know is where to find & leave the key. If your order is under the minimum for free delivery there will normally be a small charge. Drumbeg Stores ....... Last updated 16.08.2016.